We are thrilled to announce that our founder Tally Koren is back to perform and has been asked to sing for Side By Side, a Refugees Fundraiser on the 16th June. Tally will sing “Dark Hand, Light Hand” – the winning poem written by Jessica Clay, live for the first time. 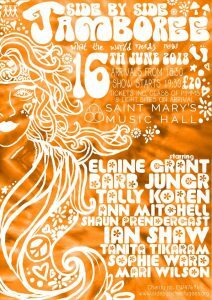 Tally will share the stage with great acts such as herchildhood hero Tanita Tikaram and the amazing actress Ann Mitchell and more.